Finally, national media coverage showing an accurate milk nutrition fact that Milk Does NOT Do the Body Good after a study from Sweden that followed a huge number of people (one study with 61,433 people and another with 45,339) for 20 years and showed that high milk intake (the current 3 glasses a day recommendation) was associated with a 60% higher risk for developing hip fracture and increased mortality risk (2014). This research goes against everything we’ve been taught about the nutrition in milk. In this 2 minute clip, Holly Phillips, MD joins CBS News to discuss a study that raises the possibility that high milk consumption may be linked with more fractured bones and a higher death rate. For those in Canada, try this link to watch the news clip. From the latest study out of Sweden in the British Medical Journal, September 2014. 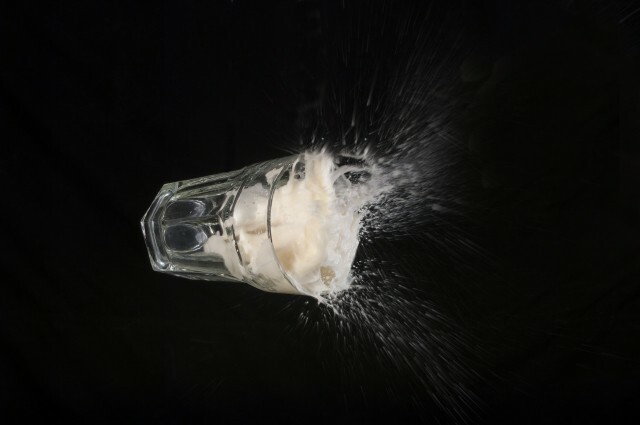 “High milk intake was associated with higher mortality in one cohort of women and in another cohort of men, and with higher fracture incidence in women. NutritionFacts.org — Is Milk Good for Our Bones? 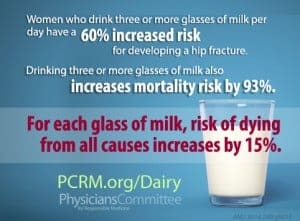 Physicians Committee statistics on milk consumption. Studies are also showing increased risks of breast and prostate cancers in milk drinkers. When you drink milk, it does in your body just what it does in a calf’s body, which is something that has caught the attention of cancer researchers. That is, milk causes the amount of insulin-like growth factor, or IGF-1, in your bloodstream to rise. As its name implies, IGF-1 makes things grow (even in grass fed cows). That’s great if you are a calf too small to eat grass. But it’s not so good if you are an adult human. In your body, rapid growth can mean the growth of cancer cells. Indeed, men with higher amounts of IGF-1 in their blood have higher risk of prostate cancer. Women with more IGF-1 have a higher risk of breast cancer. In two Harvard studies, men who had two or more dairy servings per day had 30-60 percent higher prostate cancer risk than did men who generally avoided milk. 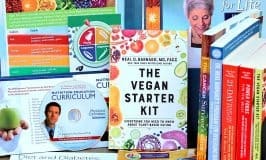 There are also studies indicating that cow’s milk proteins trigger type 1 diabetes. A new study adds more evidence that cow’s milk proteins trigger type 1 diabetes. Marcia Goldfarb of Anatek-EP, a protein research laboratory in Portland, Maine, reports having found antibodies to bovine beta-lactoglobulin in the serum of children with diabetes. Individuals without diabetes did not have the antibody. Type 1 diabetes is believed to be caused when antibodies destroy the insulin-producing pancreatic cells. Several studies have suggested that cow’s milk proteins may trigger the production of these dangerous antibodies. Milk does NOT do the body good, unless you are a calf. Amazon.com are affiliate links. When you buy something through my links, I receive a commission that helps support this site which is greatly appreciated. 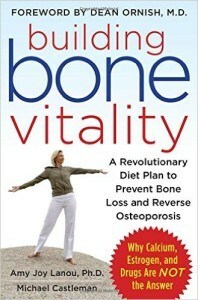 Great book on bone health and dairy consumption. Click to view on amazon. Affiliate link. 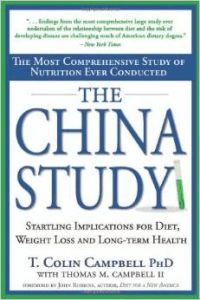 The China Study. Click to view on amazon. 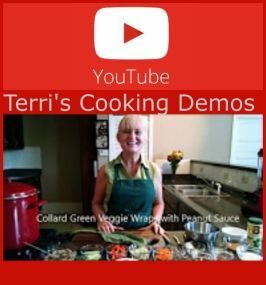 Affiliate link. Hip fracture rates are higher in milk drinkers. Interesting. This has not been true with my family. My son drank organic milk from the time he was a toddler and his bone density is insanely strong! He is also extremely healthy. My grandma grew up on a dairy farm and just celebrated her 88th birthday. My sister drank milk like crazy and she’s the healthiest one of us all.. Has this study taken into account raw dairy vs overly processed dairy? There are many studies on how the processing ruins the milks health benefits.. And yet, my sister drank processed milk (we didn’t know any better back then). Just curious..
Hi Angela, I understand your point. We can all point to someone (family or friend) that seems to have the best of health despite their bad diet, smoking, or heavy drinking. My maternal grandfather lived to 93 even though he was a heavy smoker his entire life. He was getting out and driving and enjoying life until around 91. I still believe the studies that show smoking can cause cancer. I live in the country where most of my husband’s family (and some of mine) grew up on farms for the last nearly 100 years. Last year I wrote a blog about their longevity and my misconception about their lives. 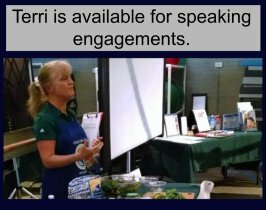 It might be of interest to you and could answer some of your questions. I find this book the best on milk use. Just shows how brainwashed we are. Even the reporters don’t like this story. Cow’s milk is good for baby cows. Human milk is god for human babies. Adults don’t need milk. This totally makes sense!!!! It’s so silly that we have all been so brain washed to continue nursing through our old age and nurse off of a completely different species! Humans are the only ones to do this!! When a species gets its teeth they can then obtain all of the neccesssary nutritional needs through eating and digesting…we only really need to drink water. Drinking cow or goat or horse, dog, cat is really quite weird when you think about it! Good marking all those years Big Dairy, good marketing! I’m no longer a customer! Dare we also talk about how cruel the dairy industry us as well? What the do to a mother and newborn is horrific. 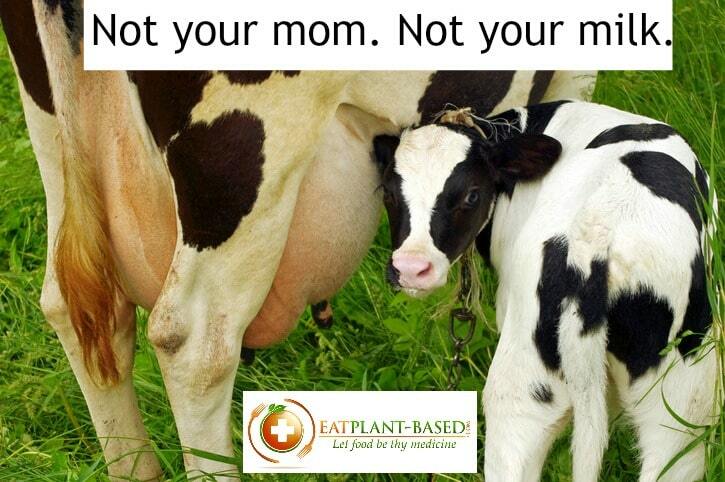 Newborn calves are not allowed to be with their mothers because humans want to nurse off if their mother’s utters! They cry out for each other. Starving Newborns are sent to slaughter to be veal and females are sent to live the same fate as their mothers then off to slaughter to be the next hamburger. A senseless cruel industry! These farmers that get our tax dollars should start growing plant milk ingredients, that industry is booming and the world is waking up!! Especially since we know that we can get CALCIUM, IRON and many more nutrients from various types of plants!! Wow what is up with that interviewer’s comment at the end? “Well I personally believe skim milk is one of the healthiest things you can drink”… I certainly wonder whether she has a payoff coming form Dairy Management. Once you realize how awful the dairy industry is and how absurd that we are the only species to drink another species’ milk (especially when it is a growth formula meant to stimulate growth in the order of 100s of kilograms) you just want the dairy industry to end ASAP. Glad that milk has been slammed so hard in the mainstream media lately though. The Washington Post has been running these types of stories too. Progress is good! My sentiments exactly. I couldn’t figure that comment out either. Cow’s milk is good for baby cows. Human milk is good for human babies. They did not talk about the amount of pus that is allowed to remain in the cow milk, never mind the large amounts of hormones pumped into those cows that doesn’t even stop all the infection that causes the pus! Why should you drink milk meant for a calf? Would you drink milk from a mouse? A giraffe? Or a hippo? Then why a cow! 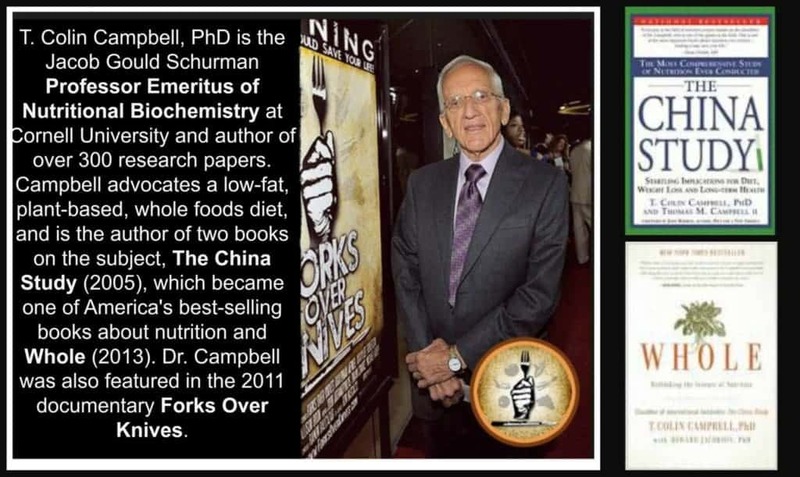 Watch forks over knives and see the truth! Of course the dairy industry will defend themselves…..duh! 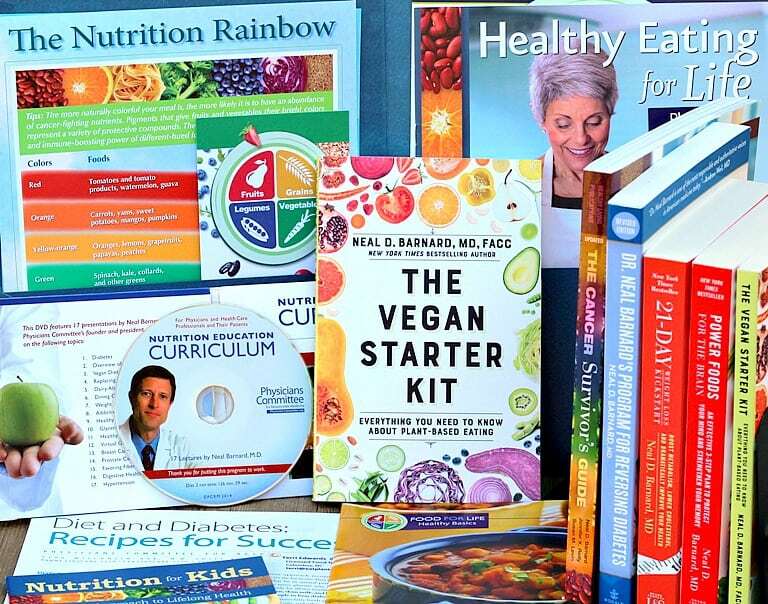 Plain and simple, dairy causes internal inflammation, inflammation causes major health issues! Don’t believe anyone though, give up all dairy for 2 weeks and see how healthy your body reacts! If you care about your health, you’ll try it!